Ninja skills can get you pretty doggone far in life alone, but true ninjitsu masters know that you just don't go into battle without the tools of the trade. Namely, a complete arsenal of ninja weapons! With this set, your child won't even have to choose their weapon of choice, because this kit will give them the ability to practice and master each weapon! They can use the katana blade to clash swords with their foes, or use the dagger as a weapon in a surprise attack. A true ninja will always choose to wield the nunchucks, because they make for a genuinely powerful weapon when mastered. And of course, no assault would be complete without unleashing a lethal barrage of throwing stars to try and thin out your opponents ranks. Now, we are going to level with you, these are plastic weapons, for use as toys or costume accessories only. (Not that we'd really want your little one to be playing with real weapons anyways!) But they will add the necessary touch of authenticity to make any little guy or girl feel like a real, bonafide ninja master. 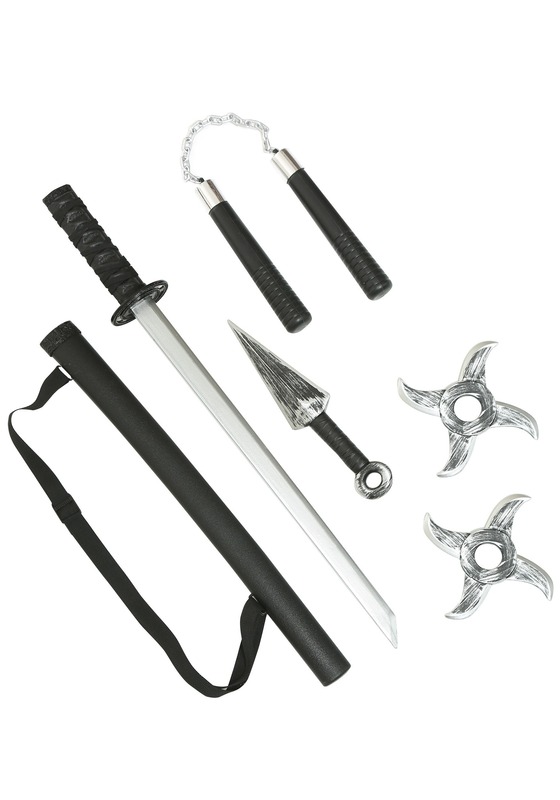 Get this accessory set to complete your child's look so that they'll have all the tools of the ninja trade!